Looking to switch up your workout? It might be time to bring HIIT into your life at our west loop gym, CrossTown Fitness. High Intensity Interval Training, commonly known as HIIT, involves short bursts of intense exercise, typically lasting 30-60 seconds. These heightened intervals of exercise are repeated with intermittent recovery periods, which can often be active. The idea is to push your body to its limit during that short amount of time to shred fat and calories quickly and effectively. There will be no leisurely magazine reading going on during this type of workout. With HIIT, you can enjoy shorter workouts without missing out on the health benefits that can come with lengthier fitness regimens. In fact, you can exercise in less than a third of the time a traditional workout takes while still burning the same amount of calories. When you’re pushing yourself during those short intervals of challenging exercise, your body is taking in more oxygen, and therefore burning more calories. Think about it this way: You burn five calories for every one liter of oxygen your body takes in. Here’s a major bonus: When you finish a HIIT workout, your body will continue to burn calories even after you’ve left the gym. This is known as the afterburn effect. Those intense periods of exercise raise your metabolic rate, boosting your metabolism for up to 48 hours after your workout. (This means you won’t have to feel quite as bad about that slice of deep dish afterward). You don’t have to have the stamina of Michael Phelps in order to be successful with HIIT. This type of workout can be adjusted to fit any fitness level, whether you’re just starting out or you’ve been active your whole life. Each exercise comes with a regression and progression, to make it easier or more difficult. Asyou become stronger, you can gradually build up to more challenging forms of the cardio and strength exercises. 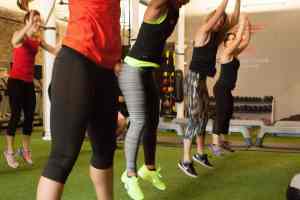 HIIT can also take various forms, including TRX training, group fitness classes or personal training sessions with expert instructors. With so many methods of high intensity interval training available, it’s much harder to become bored with your workouts. Turns out, it’s pretty important to look after your heart health. HIIT treats your heart like a muscle, helping it become stronger with every workout. Studies have shown that HIIT may be effective in helping to reduce the risk of heart disease. Want more info on high intensity interval training or CrossTown Fitness? We’re happy to answer any questions you might have!